The S. Roberts ‘General Provider’ was the first general store near Highbury. Despite an S. Roberts general store having been built near the wharf in 1904, it was deemed necessary to have another store closer to the growing shopping centre of Birkenhead. This store was established in 1913 and was situated near the top of Hauraki Street (now Hinemoa Street). Items sold included butter stamped with an acorn, made by Agnes Harkin in Hutton Road. 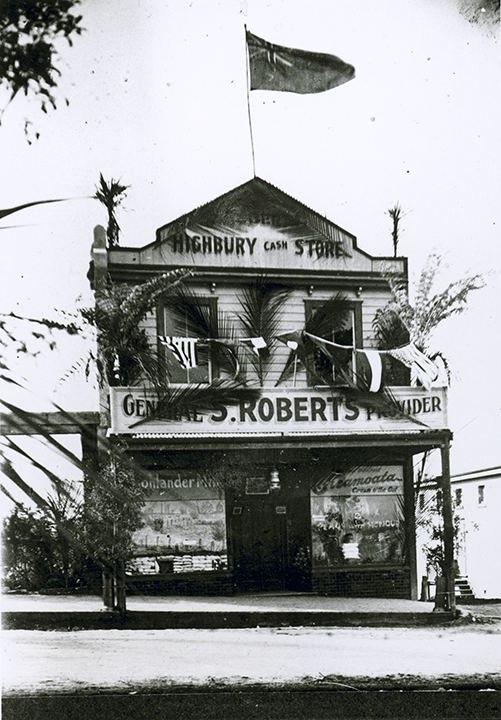 There was also another S. Roberts store half way up Hinemoa Street during the early days of Birkenhead. The building itself was one of the two first commercial buildings in the Highbury centre, along with the Hawkins grocer next door. As a substantial double-level building, it stood proud of its rather sparse surroundings. The upright facade on the top of the building bore the name ‘Highbury Cash Store’, which can be seen as a reference to the anticipation of a large potential market within Highbury. Soon after, the commercial development of Highbury boomed, with entire blocks of shops being erected to house businesses. While the village grew around it, the store remained an important part of the heart of Highbury. The store is now operating as the Royal Thai restaurant and remains largely unchanged from its original layout.